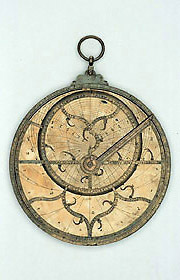 Epact: Astrolabe unsigned, circa 1500 ? It is difficult to assign a date and place of origin to this instrument because it presents a mixture of styles. The 'Y' pattern of the rete would suggest an early date and medieval number forms are used on some of the scales. However these are combined with numbers elsewhere and letters that are more characteristic of the 16th century.